A miniature infrared thermal sensor is available for non-contact temperature measurement for industrial machine monitoring applications. RS Components (RS) has launched a new RS Pro low-cost and high-performance infrared temperature sensor. Key features of the device include its extremely small size – 31mm diameter by only 30mm high – and side-entry cable, making it ideal for mounting in areas were space is limited. Other features include fast 125ms response time, built-in temperature display and controls. The device is essentially a non-contact thermometer that is designed to measure temperature from a distance. Infrared thermometers are typically used for a wide variety of temperature monitoring functions, primarily in applications where contact sensors are unsuitable, such as when the target object is moving or inaccessible, or when a fast response time is required. Use of the sensor’s analogue voltage output enables the setting of alarms, or connection to a data logger for quality checking. 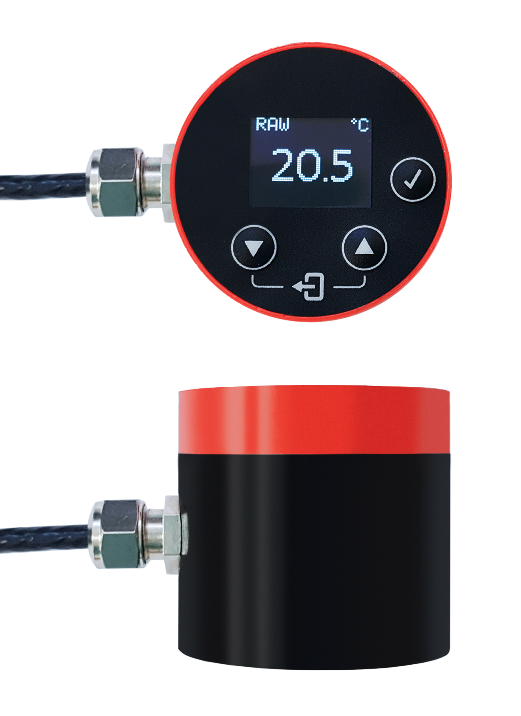 Although the new unit is similar in operation to handheld temperature measurement guns, the RS Pro device is intended as a permanent measurement unit for fixed mounting via a bracket, for example to install on manufacturing machinery to measure product temperature, or to monitor the condition of machine parts. Key industrial application examples include: product temperature measurement in paper and cardboard manufacturing; food manufacturing; pharmaceuticals; thermoforming; curing and drying; as well as condition monitoring on mechanical or electrical equipment. The unit features two simultaneous and configurable outputs: selectable voltage-output ranges from 0 to 5V, 1 to 5V or 0 to 10V DC, proving a linear voltage output with measured temperature; and an open collector alarm output for temperature threshold and hysteresis. Other features of the sensor include temperature measurement from 0 to +1000°C; accuracy of ±1.5% of reading or ±1.5°C; IP65 protection, and operation over the ambient temperature range from 0 to +70°C. Electrical characteristics include: operating supply voltage from 28V down to 6V DC, or 12V DC if the output is set to 0 to 10V, and a maximum current draw of 30mA. The unit also meets industrial EMC standards, including EN61326-1 and EN61326-2-3 for use in electrical equipment for measurement, control and laboratory applications.